Tomorrow, March 14, is celebrated by many in the US as Pi Day. Why? Well, in most of the world, the date is written as day/month/year. So in Israel, all of Europe, Australia, South America and China, tomorrow's date, March 14th, would be written as 14/3. But not here in the US. Here, we write the date as month/day/year; it's a uniquely American way of doing things. (Like apple pie. And guns.) So tomorrow's date will be 3/14. 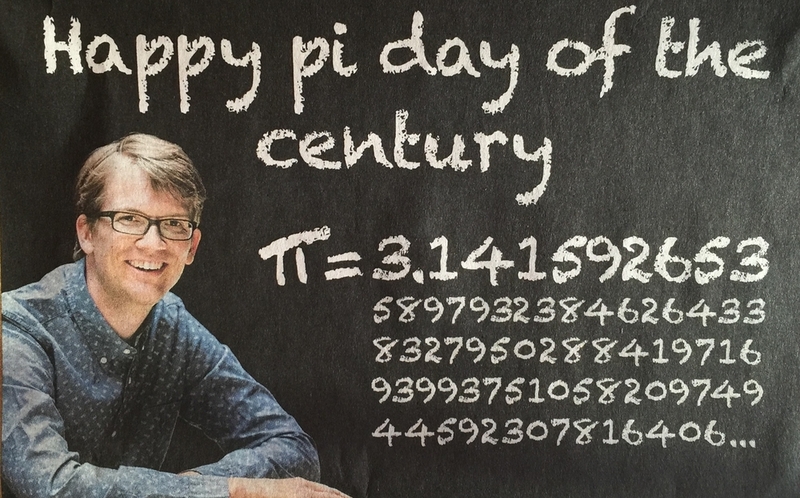 Which just happen to be the first few digits of pi, the ratio of the circumference of a circle to its diameter. Answer: The circumference was 30 amot and the diameter was 10 mot. Since pi is the ratio of the circumference of a circle to its diameter, pi in the Book of Kings is 30/10=3. Three - no more and no less. — Judah Landa. Torah and Science. Ktav Publishing House 1991. p.23. Tomorrow, March 14, is not only Pi Day. It is also the anniversary of the birthday of Albert Einstein, who was born on March 14, 1879. As I've noted elsewhere, Einstein was a prolific writer; one recent book (almost 600 pages long) claims to contain “roughly 1,600” Einstein quotes. So it's hard to chose one pithy quote of his on which to close. So here are two. Shabbat shalom, Happy Pi Day, and happy birthday, Albert Einstein. — Albert Einstein. Ideas and Opinions. New York. Crown 1954. p11. — Shaviv and Rosen (eds). General Relativity and Gravitation. Wiley. p.242. Newer PostKetuvot 41 ~ Good Dog. Bad Dog.